This bee sting cake recipe or bienenstich is popular in German-speaking countries and Hungarians have borrowed it from their neighbors. The cake can be made with or without yeast and filled with pastry cream or whipped cream or a combination of the two as it is here. 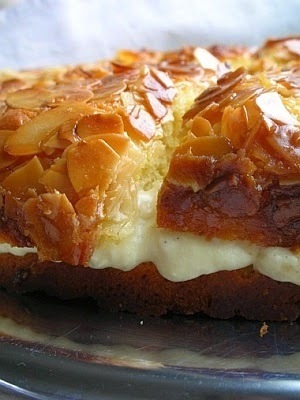 What is common among the varieties is the honey-butter-almond topping, which creates a crispy, crackly top. If you like honey, this is the cake for you -- it's in the batter, the topping and filling. For the Topping: In a medium saucepan, melt butter and honey. Bring to a boil, reduce heat and simmer 2 minutes. Add vanilla and almonds, remove from heat and set aside to cool. For the Cake: Heat oven to 375 degrees. Cut a parchment circle to fit the bottom of a 9-inch springform pan. Coat pan bottom and sides with cooking spray. Place parchment circle in bottom of pan. Combine 1 3/4 cups flour, baking powder and salt and set aside. In a large bowl or stand mixer, cream 4 ounces butter until fluffy, about 2 minutes. Gradually beat in 5 tablespoons sugar, about 3 minutes. Add 1/4 cup honey and beat 1 more minute. Blend in eggs, one at a time, beating after each. Add vanilla and half the flour mixture, and mix briefly. Scrape down sides of bowl. Add milk, then remaining flour, beating briefly after each addition. Scrape into prepared pan, spreading evenly. Sprinkle top with remaining 1 tablespoon flour, then pat top of cake smooth with your hand. Pour topping over batter, gently spreading evenly. Place pan on a baking sheet and bake 30-35 minutes or until toothpick tests clean. Do not overbake. Cool cake in pan completely on a wire rack. For the Filling: In the top of a double boiler over medium heat, combine cornstarch, milk and 1/4 cup sugar. Stir constantly until thickened, at least 3 minutes. Add in 1 beaten egg and keep stirring constantly for about 2 minutes until very thick. Remove from heat and stir in almond extract, if using. Chill in an ice-water bath, stirring occasionally. Place plastic wrap in direct contact with surface of pastry cream and refrigerate until cold, at least 1 hour. Whip the cream with the cream of tartar and confectioners' sugar until stiff. Add a dollop of cream to the pastry cream and stir to lighten the cream. Then fold in remaining whipped cream. Refrigerate while you prepare to assemble the cake. Run a knife around the edges of the cooled cake and remove the springform ring. Invert cake onto a plate. Peel off the parchment paper and invert again on a serving platter, so the almond side is showing. Cut cake in half horizontally and fill with pastry cream. Refrigerate until ready to serve.